Justified or not, Java is sometimes perceived as slow. Compared with other languages—such as C++—that are compiled into machine code, Java is interpreted at runtime; and all other things being equal, compiled machine code is faster than interpreted byte code. Of course, you might argue that Java can hold its own, mainly due to advanced technologies such as just-in-time (JIT) compilers and Java HotSpot, and you'd be mostly correct. Today's JVMs are modern marvels that wring amazing performance out of Java byte code. Regardless of modern JVM efficiency, you should always look for programming techniques that boost performance. In this installment of Java Design Patterns, I discuss one of those techniques that, not surprisingly, takes the form of a design pattern: the Flyweight pattern. Let's see how it works. Object-oriented design is sometimes at odds with performance. From a design standpoint, it's best to encapsulate everything in an object so you can treat those objects uniformly, reuse them, and extend them. Unfortunately, modeling everything as an object can be expensive performance-wise. A case-in-point is Smalltalk, which literally models everything as an object, as opposed to Java, which provides a mix of objects and intrinsic types. Today, Java is much more prevalent than Smalltalk, due in no small part to Java's better performance. Note: Java also provides static type checking, which Smalltalk lacks. Although static type checking is widely regarded as beneficial, most Smalltalk developers argue against it. Even though Java provides a mix of objects and intrinsic types, Java applications can create a huge number of objects. For example, trees can have an unlimited number of rows, so if you model each row as a distinct Swing component, you're asking for trouble. For fine-grained objects such as tree nodes, you can implement the Flyweight pattern to create a small pool of shared objects, which significantly reduces the number of objects created. Soon enough, you'll learn how to implement flyweights and share them; in the meantime, it's sufficient to understand that flyweights are shared objects and that using them can result in substantial performance gains. Figure 1 shows a class diagram for the Flyweight design pattern. Flyweights are typically instantiated by a flyweight factory that creates a limited number of flyweights and doles them out, one at a time, to clients. Those flyweights are instantiated according to some criteria. For example, you might have a pool of line objects that know how to draw lines. In that case, the flyweight factory could create one line object for each line color, such as one object for white lines and another for blue lines. Those lines, which are flyweights, get reused whenever you draw white or blue lines. If you have a drawing with 1,000 white lines and 6,000 blue lines, only two lines—instead of 7,000—are actually instantiated. Figure 2's sequence diagram depicts runtime interaction between clients and a flyweight factory. Clients don't directly instantiate flyweights; instead they get them from a factory. The factory first checks to see if it has a flyweight that fits specific criteria (e.g., a blue or white line); if so, the factory returns a reference to the flyweight. If the factory can't locate a flyweight for the specified criteria, it instantiates one, adds it to the pool, and returns it to the client. You might be wondering how you can reuse flyweights. For example, how can one line flyweight draw all lines of a particular color when those lines presumably have different locations and lengths? You accomplish that reuse by splitting a flyweight's state in two: intrinsic state (e.g., line color) and extrinsic state (e.g., line location and length). The flyweight maintains intrinsic state, while extrinsic state must be passed to the flyweight at runtime. By externalizing extrinsic state, you can easily reuse flyweights for different variations of that extrinsic state. 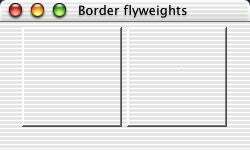 Flyweights are abundant in Java, from simple strings to Swing tree nodes and component borders. The rest of this article discusses those flyweights and concludes with an example of how you can implement your own flyweights. Because strings are usually plentiful in most applications, Java goes to great lengths to make sure strings perform well. First, strings are immutable, so they don't have to be thread-safe. Because synchronization is expensive, strings are spared that drag on performance. Second, as you might guess, strings specified at compile-time are flyweights—strings that contain the same character sequence are shared. That sharing can greatly reduce memory footprints, and therefore, increase performance. Example 1's application demonstrates Java strings' flyweight nature. Here's the application's output: true true false true. In the preceding application, the strings fly and fly2 refer to the same string object (recall that the == operator evaluates to true if the objects it compares are the same). Ditto for weight and weight2. Strings computed at runtime, such as distinctString in the preceding application, are not flyweights by default; however, you can force the issue with the String.intern() method—a poorly named method that brings to mind medical topics, but nonetheless returns flyweights for strings computed at runtime. Because the Java compiler implements the Flyweight pattern for strings, I can't show you how it's done. So, let's move on to another flyweight implemented in the Java APIs. Swing comes with an exhaustive set of borders for its components, including line borders, titled borders, bevel borders, etc. Figure 3 shows an application that fits two panels with a bevel border. You can implement component borders in numerous ways. The GOF book, for example, shows you how to implement them with the Decorator pattern (see page 175), but in Swing, they're implemented as flyweights for maximum performance. Additionally, Swing lets you instantiate a single border per component if you wish, but it also provides a border factory that creates flyweight borders so a single border can be shared among multiple components. Example 2, the listing for Figure 3's application, illustrates the use of that factory. The preceding application's output is: bevel borders are shared, which means the two panels share a single border instance. Notice that BorderFactory.createRaisedBevelBorder() is somewhat of a misnomer because it doesn't actually create anything if a bevel border already exists in the factory. The arguments passed to paintBorder() represent a border's extrinsic state, namely, a component, a graphics object to draw in, and the border's bounds. Because a border can be a flyweight, and therefore shared by multiple components, the border does not maintain that extrinsic state. Swing tree nodes are excellent candidates for the Flyweight pattern. Consider Figure 4, which shows a Swing tree that acts as a file explorer. 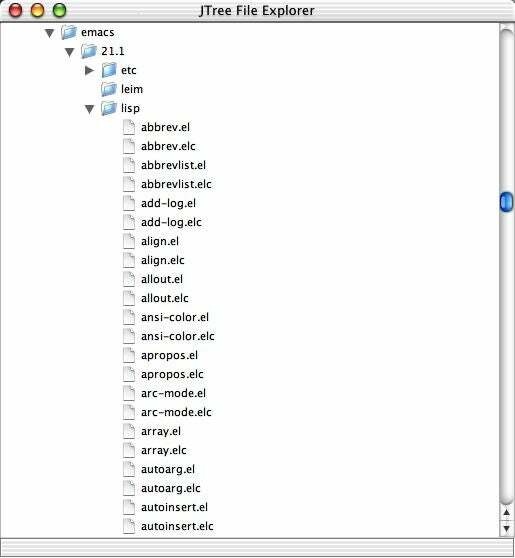 As a testament to Swing's design, a file explorer like the one in Figure 4 is straightforward to implement. In fact, it's a mere 144 lines of code, blank lines and all. As a testament to the Flyweight pattern, that file explorer is fast. If you wish, you can download this article's source code and take the file explorer for a spin. If you do, explore some directories with a lot of files so you have a tree with many nodes like Figure 4 (note the scrollbar thumb's size). Then grab the scrollbar thumb and move it up and down as fast as you can. You'll see that performance is excellent. By now, the sheer number of arguments to getTreeCellRendererComponent() should indicate to you that the component returned from the method is a flyweight. Like Swing borders, tree cell renderers are passed extrinsic state so the rendering component can be shared. The getTreeCellRendererComponent() method sets the component's properties depending upon the extrinsic state. For instance, for folders, getTreeCellRendererComponent() fits the component with a folder icon; if not, it uses a document icon. As an aside, Swing tables render table cells in the same manner as Swing trees. One component represents all the cells for a single table, so Swing tables also have excellent performance. So far I've detailed three Flyweight pattern examples in Java, but for you to understand the Flyweight pattern completely, let's implement a flyweight from scratch. The rest of this article implements a line flyweight similar to the one discussed at the beginning of this article. We'll explore that implementation in three steps. First, I implement an application that draws 10,000 lines without the aid of a line object, by simply painting repeatedly into a graphics context. Second, I implement a naive Line class that cannot be shared. Third, I turn that naive implementation into a flyweight. Figure 5 shows the line-drawing application. Example 3 lists Figure 5's application.